It&apos;s so long to summer, hello to fall! We&apos;ll miss these warm-weather months—baseball games, summer festivals, outdoor concerts and such. But we&apos;re ready to embrace a new season and the new experiences that come with it in Raleigh, N.C.—hockey games, cultural festivals, holiday shopping, pumpkin pies (and beers and lattes! ), lots of ways to experience the arts and the N.C. State Fair. Yes, definitely the Fair! 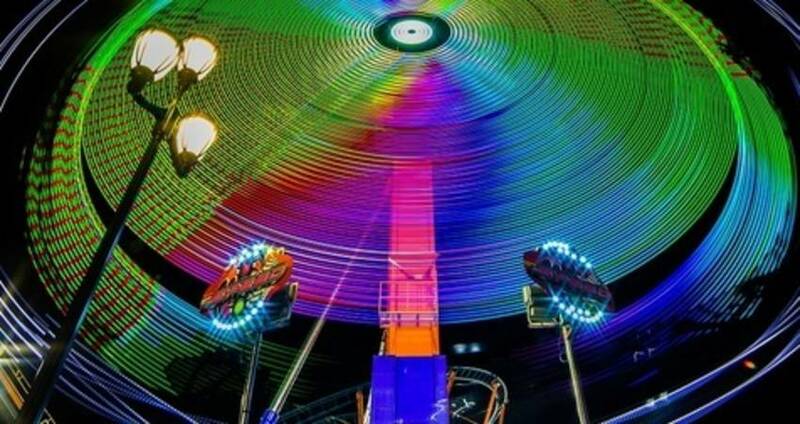 For many, the return of the N.C. State Fair (10/12-22) marks the true beginning of fall. Sunny days turn into cool and clear nights where smells of cotton candy fill the air, blinking lights from Ferris wheels and roller coasters light up the skies and jackets and sweatshirts become a necessity. The largest annual event in N.C., with around 1,000,000 visitors, this is the chance to search out thrilling rides, take in free concerts from local artists plus devour the most over-the-top food concoctions you can imagine—think chocolate, peanut butter, bacon, doughnuts and tons of other gooey goodness. Eleven days. Three stages. More than 100 concerts. That&apos;s the scope of the 2017 N.C. State Fair&apos;s music lineup featuring local musicians from across the state. You&apos;ll be treated to bluegrass, rock, jazz, heavy metal, country, gospel, beach music and more from acts like Parmalee, Ronnie Milsap, Marcy Playground, Shana Tucker, Chairmen of the Board plus so many others. As a serious bonus, admission to every concert is free with paid admission to the Fair! Learn more about the Homegrown Music Fest from concert curator Dave Rose here. Bring on the deep-fried fun! More than 25 new foods have been announced for the Fair this year. Hot foods, frozen foods, messy foods—all the over-the-top goodies you could possibly want in one spot! New standout treats this year will include a deep-fried pumpkin pie, a Cheerwine funnel cake, Flamin&apos; Hot Cheetos corn on the cob and a Thanksgiving egg roll (yes to all of that!). Check out more of the new dishes here. Those goodies, plus the usual suspects—bacon on a stick, Krispy Kreme burgers, fried Oreos, turkey legs and more—are sure to keep Fair-goers happy. Of course you&apos;ll want something to wash all that food down with, right? For the first time in the history of the N.C. State Fair, beer and wine flights will be available for purchase from 40 local wineries and 40 local breweries at the new Our State Public House in Heritage Circle. Daily offerings will include several different styles of craft beer and wine, including award-winning examples of each (everything from fruity, full-bodied red wines to pale ales and IPAs showcasing hop flavor and aroma). Tickets for a flight will be $10. The Our State Public House, plus more attractions, rides and games, are on our list of 25 things to do at the Fair this year! Is it Oct. yet? That&apos;s what hockey fans have been asking for a few months since the Stanley Cup Finals ended in June. Yes, it&apos;s Oct., and that means the NHL&apos;s Carolina Hurricanes return to the ice at PNC Arena to kick off their 20th anniversary season in Raleigh. The Canes (as everyone locally calls them) will play five home games this month, with the puck dropping for the first time against the Wild (10/7) on opening night. They&apos;ll also take on the Blue Jackets(10/10), Lightning (10/24), Blues (10/27) and Ducks (10/29). Single-game tickets have gone on sale, so join the #Redvolution by wearing red, white and black and cheering on the Canes! Just a few hundred feet away from where the Hurricanes take the ice, the North Carolina State University football team hits the gridiron at Carter-Finley Stadium with eyes set on a breakthrough season. They&apos;ll look to make a #STATEment against Louisville (10/5) at home in a nationally-televised Thurs. night battle between two highly-ranked teams. See the rest of the Wolfpack home schedule here. In the town of Cary, the North Carolina Courage (women&apos;s professional team playing in the National Women&apos;s Soccer League) secured a first-place regular season finish and now look to make a championship run in the playoffs. They&apos;ll face the Chicago Red Stars (10/8) at WakeMed Soccer Park to get started, and we expect the crowd to be big and loud! Falling leaves and cooler weather bring all types of new experiences to the City of Oaks, so we pulled together 30 hand-picked things to do to take advantage of it all! Among them? We&apos;re eating, drinking and reading at Brewery Bhavana (one of the top 10 new restaurants in America, according to Bon Appétit); touring a distillery specializing in handcrafted rum; exploring more than 5,000 acres at N.C.&apos;s most visited state park; getting lost in a sea of corn at Ken&apos;s Korny Corn Maze; sipping cocktails and enjoying stunning views at the area&apos;s best rooftop bars; treating ourselves to a super-relaxing spa day at the five-star Umstead Hotel and Spa; spending a day in the town of Wendell exploring buzzed-about coffee shops and an 85-acre kayaking gem; plus way, way more. See the full list here, and shoot us a note on Twitter if you need more suggestions! Led by a class of creative artists and innovators, the area is bursting at the seams with an endless supply of live performing arts and visual arts galleries. Home to a must-see collection of museums and nationally-acclaimed presenting organizations, the destination is ripe for artful exploration for this fall. At CAM Raleigh, artist Dorian Lynde&apos;s critically-acclaimed No Damsel exhibition has been extended through Jan. 2018. The exhibition—which features a series of murals and paintings with reimagined, modern-day Disney princesses—will get a fresh round of installations this month. At the North Carolina Museum of Art, a traveling fashion show exploring a history of concepts that redefined beauty, style and empowerment for African Americans opens this month. Inspring Beauty: 50 Years of Ebony Fashion Fair(10/28/17-1/21/18) will feature 40 stunning outfits by Christian Dior, Givenchy, Alexander McQueen and more. More visual arts not to miss—check out the latest gem of an addition to the Raleigh arts scene, North Carolina State University&apos;s Gregg Museum of Art & Design. The free collecting and exhibiting museum with more than 34,000 objects celebrated their grand re-opening late this summer in a beautiful new building on the edge of campus just outside of downtown Raleigh and currently has three rotating exhibits on display. For incredible performing arts, look to Carolina Ballet, celebrating their 20th anniversary season in 2017/2018. They&apos;ll get you in the Halloween spirit with their rendition of The Legend of the Sleepy Hollow & Other Haunted Tales (10/12-29). In all, we&apos;ve rounded up more than 20 arts events to fill up your calendar this fall—see the full list here! Music never stops in Raleigh, N.C.! The destination with the most live music in the state has the month ahead looking like another great one. You can look forward to the Zac Brown Band (10/6), Kid Cudi (10/11), Bruno Mars (10/12), Groove in the Garden featuring American Aquarium (10/21), Portugal. The Man (10/26), Lettuce (10/29) and so much more. As always, for a full calendar of live music events in the area, keep an eye on themostnc.com. Attention, foodies! Some of the final food truck rodeos of the year are straight ahead. Make a beeline for the Downtown Raleigh Food Truck Rodeo (10/8) and the Downtown Garner Trick or Eat Food Truck Rodeo (10/22). The Fourth Annual Triangle Oktoberfest (10/6-7) at Cary&apos;s Koka Booth Amphitheatre is set to provide plenty of family-friendly activities including live music, storytelling, dancing and traditional Bavarian food and fare (plus local and authentic German beers on hand). Join 10,000 people at Celebrate Fuquay-Varina Festival (10/7) for live entertainment, a chili cook-off, childrens&apos; activities plus tons of arts and crafts to pay homage to the town&apos;s rich history. See some of golf&apos;s best—including Bernhard Langer, John Daly, Vijay Singh, Colin Montgomerie, Thom Lehman and more—at the SAS Championship (10/13-15), a PGA Tour Champions event. Music, dance and theater, a handicraft bazaar plus Indian food, art and culture highlight Cary Diwali Festival (10/14) at Koka Booth. Test (and treat!) your palette at the Wine, Cheese & Chocolate Festival (10/14) and the 3rd Annual N.C. Wine Festival(10/28) this month. Cheer on some of the world&apos;s best bull riders as they face off with the sport&apos;s fiercest bulls at the Professional Bull Riders Built Ford Tough Series (10/14-15) event at PNC Arena. Indulge in food, dance, beer, coffee and more from 70+ ethnic groups represented at the 32nd International Festival of Raleigh (10/20-22). Get your tickets for An Evening With David Sedaris (10/23), the Raleigh native whose sardonic wit and incisive social critiques have made him one of America&apos;s preeminent humor writers, at the Duke Energy Center for the Performing Arts. Click here to see a full calendar of events in Raleigh, N.C.